How can you tell that a bike trail is poorly designed? One tell tale sign is literally as sign that says, "Dismount - Walk Bike." When was the last time you saw a road sign for motor vehicles that said "Stop Your Car and Get Out?" See my point? The trail designer fundamentally does not understand what using a bike for transportation is. He or she should be doing something else for a living. Which brings me to bollards. Bollards are columns of steel or concrete intended to stop a motor vehicle. They are unforgiving by design. If you hit one while passing on a bike, the bollard will win and you will lose. Every time. Certain trail designers have a bollards fetish like they are lingams. They put them everywhere. Sometimes they are the lesser of many evils. Pennsylvania Avenue in front of the White House has bollards. They stop truck bombs. This is a good thing. This raised manhole cover is in the shade. The underside of the bridge has been under development as part of the rehabilitation of the adjacent Jones Point Park. While this work has been underway, detour after detour has been built for the MVT, every last one of them has been unsafe, and some downright treacherous. Many trail users, including myself, have called to complain. Within weeks the troublesome detour is replaced by another equally treacherous one. It has been simply unbelievable. These new bollards are more visible and narrower. A few weeks ago, the direct routing of the trail under the bridge was closed. A detour directed cyclists through a gravel strewn curb cut onto the sidewalk. In the middle of the sidewalk was a telephone pole. Right next to that was a utility box cover that protruded from the pavement by about an inch. Dodge one obstacle and hit another. Once you made it around the detour you exited the sidewalk back to the trail. The transition from curb to trail was one long irregular gap, perfectly suited for a bicycle tire. To add to the mess, gravel was strewn about here as well. Once clearing this hazard you had to make a sharp turn to avoid a jersey barrier and some orange barrels placed mid-path. This was followed by a raised man hole cover (actually the pavement had been lowered, but the result is the same) situated in the shadow of the bridge. 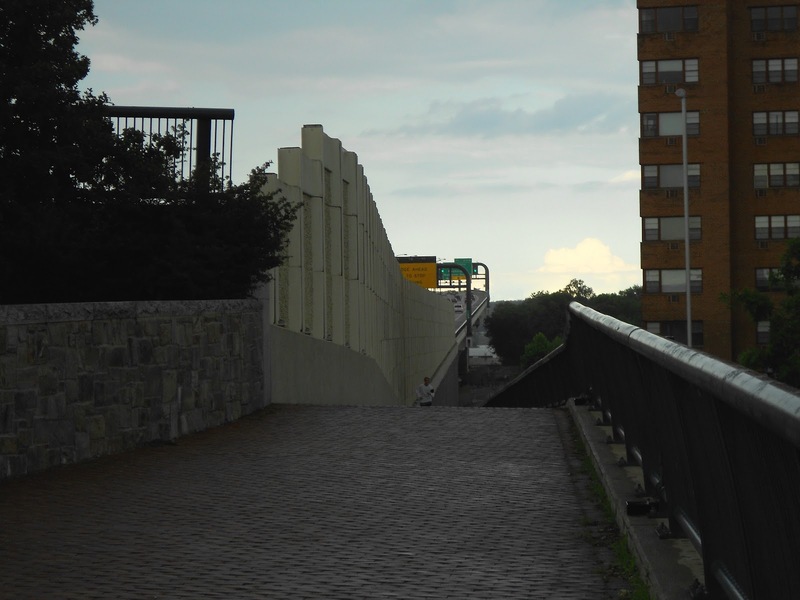 Once beyond the northern side of the bridge, trail users encountered a raised curb protruding into the trail. The trail takes a 90 degree right hand turn at the southern end of the bridge. Beginning a few weeks ago on Bike to Work Day (I kid you not), construction crews blocked the trail after the right hand turn. The detour took you over a gravel transition to pavement then through a hard right turn back to the trail. This might be good for cyclocross but not a bike trail. In fact, on Bike to Work Day, a cyclist hit the gravel transition and blew out a tire. At one time or another cyclists have complained about various aspects of these detours. Most recently a cyclist whom I met only tonight as I took pictures in the rain, complained about the mid path telephone pole. He was assured that it would be removed in a couple of weeks. Four weeks later it was replaced with three black bollards. About the same time three black bollards were placed across the trail on the southern side of the bridge. These three bollards are at the base of a long ramp and would be encountered at speed. These bollards replaced the telephone pole. About a month ago at the base of a ramp leading to the MVT near Rosslyn, a cyclists clipped a bollard and ended up in the hospital. It is simply astounding to me that just 9 miles away, six black bollards would be installed on the trail. I wonder if the city can be sued if someone hits them. And the chances of someone hitting them are 100 PERCENT. How many people will have to be taken to a trauma center before this mess gets fixed? What will it take for officials from the City of Alexandria to find someone competent to monitor future work. When I complained about this for the umpteenth time online today (yes, in the past I have contacted authorities to no avail), the president of the Washington Area Bicyclists Association (WABA), the biggest bike advocacy organization by far in the region, told me that I should advocate for myself as WABA can't possibly deal with such trivial situations. They have bigger fish to fry elsewhere. In essence, he told me (albeit politely) when I clearly was frustrated and sick of the situation, to pound sand. "Since 1972 the Washington Area Bicyclist Association has been fighting hard to ensure that you can ride wherever you want to go safely." Later today I received this tweet: Working on these issues. Email advocacy@WABA.org if you want to discuss. Instead I am sending them a link to this blog. I am discussed-ed. Many thanks to Washcycle.com for posting many of my older detour pictures over the past year. Somebody told me the other day that you are more anti-bollard than I am! That's saying something. Feel free to weigh in to WABA (they are now involved) and the Alexandria Bicycle and Pedestrian Advisory Committee. Thanks for your comment. A lawyer friend of mine said that the downhill slope into bollards on the south side of the bridge is a lawsuit waiting to happen. The farther I ride, the less I know. Considering how much bicycling I do, I'm pretty clueless. Don't hold it against me.